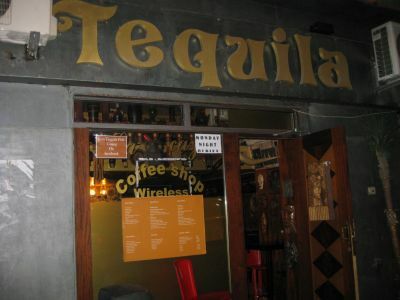 Tequila Pub Beirut: Fly filled booze haven or uncover Narc den? It was just your average Monday night. Several hours watching gangster movies followed by a peaceful stroll down Gemmayzeh Street. I was looking for a place to sit, and contemplate my existence. Nothing looked suitable. Torino too full. EM Chill too far away. Black Ice bar was just, well, Black Ice bar. And then I stumbled across a booze hole I had not dipped into since my last stay in this fine city. Tequila Pub. I figured I had got this far, I might as well give it a go. I could buy a drink and pour it straight down my throat without the rancid unwashed glass touching my lips. Hey, if I bought a bottle there was a 30% chance it wouldn’t have a rare stain of fruit fly incubating a bottom. Inside it was darker than it used to be, which for Tequila Pub is saying something. But the red glow from the dusty bulbs was less Roxanne and more Dusk Till Dawn. I was ready for a rock band of gruesome vampires playing dead bodies for guitars. But instead it was somehow worse. Sitting around a laptop, with a picture of his beloved soft top Mercedes on the screen, was the pony-tailed bar owner, surrounded by a group of off-duty Police, looking snappy in camouflage. But why where they there? As I sat with my beer I tried to figure it out. The cops didn’t look like they were having a word about the hideous music he was playing. They all looked pretty comfortable, like friends. Or colleagues. And then it hit me. Tequila may be just a front? And Shawky really an undercover cop? 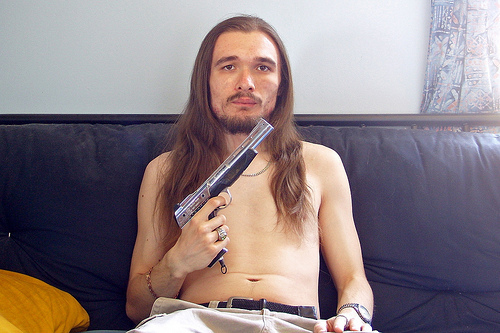 Visions of him kicking doors down with a revolver, long hair blowing being him, filled my mind like bad dreams. He would have an endless supply of one-liners as he burst in on the gangsters, string vest and Aviator sunglasses. ‘This round is on me boys!’ BANG BANG BANG! ‘Any last orders?’ RAT TAT TAT! ‘Time to pick up the cheque…’ BOOM! Then of course he would jump into his Mercedes without opening the door and ride way into the sunset listening to 80s power rock guitar solos. The image proved too much, I was freaking out. I poured my beer down in one go, flies and all, and hit the street. No more Tarentino movies for me. Until the weekend anyway.